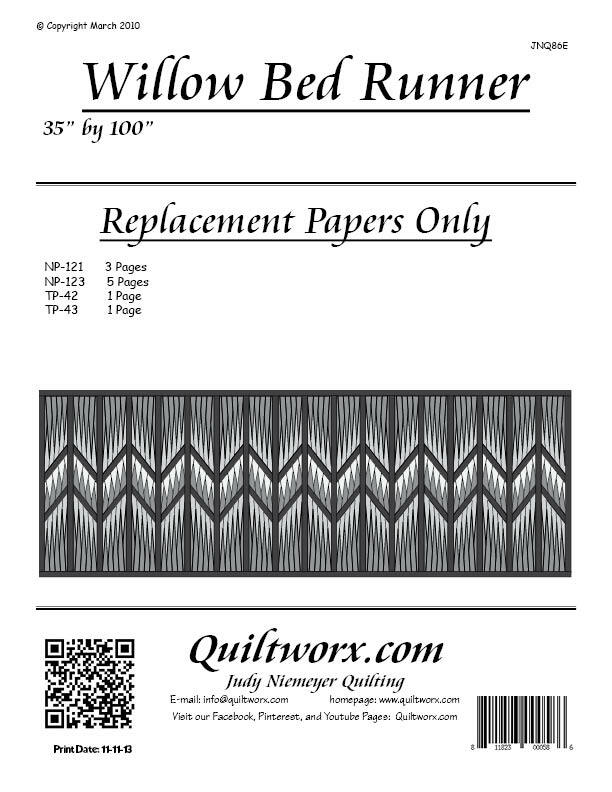 Judy and Bradley Niemeyer designed the foundation papers, paper piecing technique, and layout for the Willow Bed Runner shown on the cover. A special thanks to Hoffman California Fabrics for providing the fabrics for the samples shown. Jeanne Bilodeau Love the colors! Donna Morgan Thank you Judy for all these beautiful patterns. Wonderful color choices. Jo Ann Irwin Undlin Love it!!! Lyndall Woods I love it!! Congratulations!! Willow Bed Runner, Quiltworx.com, Made by Certified Instructor Diana Simkins. Barbara Faye Henard Burnham Awesome! Peggy Benjamin WOW - Gorgeous! Mary Godowa-Cristy WOW - LOVE THE COLOR N DESIGN - AWESOME!! Cheryl Piemonte AWESOME is right! Great job! Willow Bed Runner, Quiltworx.com, Made by CI Roger Kerr of CS Quilting From The Heart. Karena Jane Berger-Cherry Great Coloradans terrific work. Willow Bed Runner, Quiltworx.com, Made by Jane Reents. Willow Bed Runner, Quiltworx.com, Made by Delia Dorn. Anita Williams <3, <3, <3 it! Rodna Radon Williams L O V E IT!!! Willow Bed Runner, Quiltworx.com, Made by CI Jane Reents. Jayne Borgelt Congrats Jane, for being certified! You are amazing; I'm so proud of you! Anita Harvey McDaniel Love that.